The team behind The World Champion Pie Eating Competition at Harry’s Bar have successfully sent a meat and potato pie into the stratosphere. The pasty based staple of any Wigan resident was attached to a weather balloon to capture this amazing footage at about 11:30 GMT ahead of the World Pie Eating Championship next week. The aim was to see if its journey up to 100,000ft (30km) changes the molecular structure of the pie making it quicker to eat. 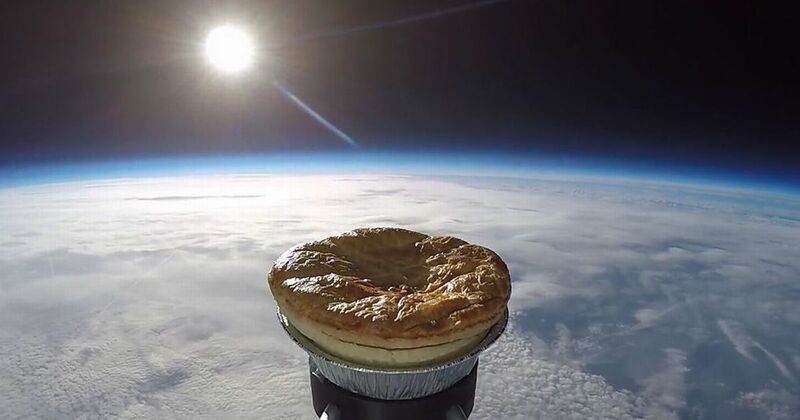 It is believed this is the first pie to be launched into the stratosphere. Space enthusiasts from Sheffield-based SentIntoSpace attached a camera and tracking equipment to the weather balloon and will analyse the data and edit video of its journey. Ultimate Purveyors from St Helens, were commissioned to make the pie. The World Pie Eating Championships was held at Harry’s Bar, Wallgate Wigan, on 20th December 2016. The pioneering delicacy was launched from Roby Mill, Wigan, at about 11:30 GMT ahead of the World Pie Eating Championship next week. The aim is to see if its journey up to 100,000ft (30km) changes the molecular structure of the pie making it quicker to eat. The humble comestible was attached to a weather balloon by a team from Sent Into Space – and sent on an upward journey reaching about 100,000 feet. If you walked past the Fifteens at The Fox pub in Roby Mill, Wigan at around 10.30am on December 15, you may have seen a group of men in white lab coats stood in the car park, watching a pie sail into space.